I have big pores. That must be why nearly every fragrance I’ve ever tried has sunk into my skin never to be smelled again. It’s frustrating: I POUR perfume on and 3.5 seconds later it’s as if I washed it all off with a fire hose. No scent remains. It’s weird. Where does it all go? Perhaps the perfume is absorbed by my vital organs. I bet when I’m autopsied, my liver smells awesome. Of course, I eat a garlic clove and can’t escape the noxious smell cloud for days. I find this imbalance of scent retention upsetting. 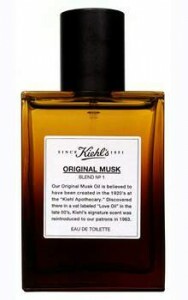 I must tell you that I love musk. Not the Jovan kind or the husband-just-home-from-a-workout variety, but the real, musky musk scent of bergamot and whatever the hell musk is…What is musk? The Kiehl’s website assures me it’s not procured from a bull (or any other animal), so that’s heartening, but still…musk? Wha-? I should Wikipedia it. In any event, I spritz this musk on ad nauseam and continually get compliments. People smell me! And not the Garlic Me, but the Musk Me of Sensuality and Bergamot. Or whatever the hell musk is. I highly recommend it for bull-loving, big-pored people like myself. I’m not bull-loving, but I am a Taurus with big pores. I wish the internet had scratch and sniff! I have a big nose- and therefore can smell ANYTHING. Musk is such an odd word. Musk makes me think of Avon perfumes…just sayin’. I am throwing my musk away now.